This classic carnival game is on a steel frame that folds out to be free standing. It is 4 feet tall and 4 feet wide and weighs 22 lbs. 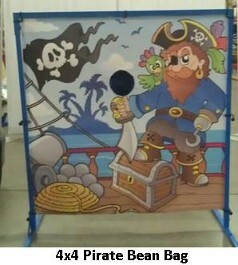 You play it by throwing beanbags into the hole. 3 of 3 is first, 2 of three is 2nd, 1 or none is consolation. The frame is a 5 piece frame that uses no bolts. Comes with 12 beanbags.